There is no doubt that standalone headsets, be they for AR or VR, are starting to pick up some steam. This momentum is especially noticeable with headsets like the ODG R9, HTC Vive Focus, Lenovo Mirage Solo and the Oculus Go. Smartphone designs like Gear VR and Daydream are fundamentally incompatible with long-term VR usage. Now that we have standalone VR headsets and the market is starting to heat up it only seems logical that we would finally start to see XR-specific components. One of the most expensive components in an XR headset is also one of the most important parts of the headset, the SoC (system on chip) which does nearly all the device’s processing. Qualcomm’s smartphone chips that are powering nearly all the standalone XR headsets today are repurposed for XR uses. Because Qualcomm’s chips are designed to be very low-power and high-performance, especially on graphics, they are uniquely suited to power standalone XR headsets. However, there are certain aspects of the smartphone design cycle and SoC design that aren’t optimized for XR. As a result, the cost of using a Snapdragon smartphone chip is higher than it needs to be since not all the components of the smartphone SoC are being used. By building an optimized chip for use in XR headsets, Qualcomm is enabling their many partners in the XR ecosystem to be able to build higher quality devices with more features at lower cost. That gets us to the Snapdragon XR1, Qualcomm’s first and the industry’s first built-for-XR SoC to power a standalone headset. The XR1 is the first in what I expect to be a series of XR-specific SoCs targeted at satisfying the needs of headset manufacturers and the developers that build applications for them. However, the XR1 is not the pinnacle of VR or even mobile VR for that matter; the XR1 is designed to hit the segment of the market that delivers a high-quality VR experience at an affordable price. This isn’t quite the same as the premium quality devices that feature the company’s fastest and most expensive SoCs (Snapdragon 835 and 845). While there is no defined price point that the XR1 is trying to hit because of the flexibility of being an XR-capable chip, I expect that the XR1 will deliver a good experience regardless of the device…but with limitations. Remember Vanishing Realms? The VR role-playing game (RPG) that got a very promising Early Access release at VR’s launch? It’s been a long time since we’ve seen anything significant from it, but Vengeful Rites looks like it could fill the void it’s left. This new fantasy game from Deep Dive Interactive is coming to the Oculus Rift and HTC Vive via Early Access in August. Designed exclusively for VR, players embark on an adventure across a world consumed by monsters. You’ll use a mix of sword combat, archery and even magic to defeat enemies in one-on-one battles that look similar enough to Vanishing Realms to catch our attention but also promises the chance to expand on the foundations Indimo Labs laid down. The trailer below suggests the melee combat in particular will be quite refined and the developers say they want to make it difficult. That’s good by us. Outside of combat, you’ll also find a perk system that allows you to customize your play style, mining to enhance your weapons and puzzles that hide optional treasures. The game will feature both smooth and teleportation-based locomotion as well as climbing. The game will launch with its first chapter complete, including a tutorial. Over the course of Early Access, Deep Dive plans to add three new chapters, each including two to three hours of gameplay. These will add new spells, weapons, puzzles and enemies. The studio wants the full game to offer around 12 hours of content which, by VR’s standards, is pretty good. Early Access is planned to last around a year. Look for Vengeful Rites to launch on August 31st. Rebellion, the same publisher behind the VR-revival of Battlezone, is today announcing a brand new VR title called Arca’s Path, which is slated for most all major VR platforms later this year. Arca’s Path is in development by Dream Reality Interactive, a London studio founded by experienced VR developers that helped create PSVR Worlds for Sony’s flagship headset, as well as Wonderbook. As you can see in the trailer above, Arca’s Path is a beautifully abstract world that raises tons of questions. I’m getting an esoteric endless runner meets adventure game type vibe, but I’ve got no clue if that’s accurate or not. We’re told that “skill, instinct, and awareness” will be needed to guide a girl through a dangerous labyrinth in the land of Arca. That’s literally all we know. According to the press release Arca’s Path will also be playable without a controller, which leaves me curious about how exactly it controls. Perhaps it’s all gaze-based, similar to Bazaar? Arca’s Path is expected for PSVR, Rift, Vive, Windows VR, Go, and Gear VR this year. That’s a lot of headsets. We’ll find out more very soon at E3 2018 next month as we go hands-on with the title and see what it’s really like. Let’s get this out of the way first: Downward Spiral: Horus Station is not a rip-off of Lone Echo. Yes, the zero gravity traversal is strikingly similar to Ready at Dawn’s Oculus exclusive but we actually saw it first in Downward Spiral: Prologue, which released a little over a year ago now. More than that, though, 3rd Eye Studios’ brilliant new sci-fi game is less interested with the blockbuster thrills of its contemporary, instead in pursuit of a different kind of space odyssey. The entire four-hour campaign comes and goes without a single spoken word, for example, leaving you to piece together the story of a survivor exploring the wreckage of a space station. The void is filled by a mesmerizing soundtrack that lures you along each deserted corridor and barren control station, effortlessly switching from swathy mystery and intrigue to rhythm-setting action pieces when the time arises. Then there’s that combat, which somehow finds a natural fit in an otherwise atmospheric exploration game. Add to that full co-op support and a competitive multiplayer mode to boot and Horus Station is quite the package. Much of your time onboard Horus Station is going to be spent throwing yourself out into the zero gravity open, catching yourself on the closest wall, realigning and then doing it all over again. Even after hours of Echo Arena and the like, this remains one of the most convincing and outright enjoyable means of getting around in VR, which is fortunate considering there are lengthy sections of the game where it’s all you’re doing. Just getting from A to B is an enjoyable game in its own right here, though 3rd Eye does lean a little too hard on the mechanic at times. Some of the eight acts feel like they come and go without much of anything happening, even if you are rigorously hunting down plot points in the game’s environment. It’s a testament to the intrigue that 3rd Eye drums up that I never found myself getting bored, though. Every new area I entered felt like a discovery worthy of inspection, be it wondering how the poor soul floating in the middle of the room met his end, or catching a rare glimpse of the ominous orange planet that Horus Station orbits around. I was constantly curious as to what I’d find behind each and every one of the facility’s enormous doors, as if the answers left by the harrowing pile of corpses I was wading through were always right around the corner. They’re often not; this is a story that will only stretch as far as your imagination lets it, but the powerful atmosphere drags you through all the same. Endnight Games’ The Forest finally launched in VR last week, though very much in an experimental phase. Some of the issues players have been having are addressed in a just-released patch, though. For the second patch to The Forest’s VR beta Endnight has incorporated plenty of ideas and suggestions from the community. There are simple fixes to make the survival game a little more intuitive, like adding a laser pointer to menus to make it easier to select options, and bringing in indicators to show you how long you need to hold a button to pick up an item. One of the most-requested features, controller-based direction for movement, is also included now too. Other fixes make The Forest more immersive in VR. There’s a new physical crouching option, for example, allowing you to simulate sneaking through the game’s wooded world. Moving a lighter next to a campfire will light it meanwhile, and the overall feel of firing a bow and arrow has been improved. Full release notes are below. It’s a nice update, though there’s still plenty more work to be done on the game. For starters, the game’s cooperative multiplayer options still aren’t included in the VR beta, and we’re looking forward to their eventual integration. We’ll bring you full impressions once the game is in a more complete state. It wasn’t too long ago that Sony slashed $100 off of the price of its PSVR headset, taking it down to $299.99 with bundled games. But you’ll be able to get the kit for even cheaper during an official promotion next month. Yesterday, Sony announced Days of Play, a 10-day promotional event taking place across the globe. From June 8th – 18th you’ll be able to get a PSVR bundle for $199.99 USD/$249.99 CDN. It’s not clear exactly what bundle this will be, though the cheapest way to get the current PSVR unit (not the original model that was replaced last year) is via a pack that includes a copy of Doom VFR for $299.99. It’s possible that’s the deal we’ll get during Days of Play, then. Over in the EU, meaning, you’ll be able to get the PSVR Starter Pack, which includes a copy of PlayStation VR worlds, for €249.99. That’s far from where the deals end, though. Sony is also offering a limited edition Days of Play VR for $299.99 USD/$379.99 CDN which comes with two specially-themed controllers. As for standalone controllers, a DualShock 4 will run you $39.99 USD/$49.99 CDN, a pair of PS Move motion controllers will cost $79.99 USD/$99.99 CDN, and the standalone PSVR Aim controller, available only in the US, will cost $49.99. As for games, you’ll be able to get Gran Turismo Sport for $19.99 USD/$29.99 CDN, Farpoint for $14.99 USD/$19.99 CDN, The Inpatient for $14.99 USD/$19.99 CDN and Bravo Team for $29.99 USD/$39.99 CDN. Quick hint: don’t get Bravo Team. Notably, the promotion is running over E3 2018, including Sony’s showcase on Monday, June 11th. If you don’t feel like there’s much of a reason to pick up PSVR thus far, let’s hope Sony gives you a few more reasons then. Budget Cuts is releasing soon later this week and we’ve had access to a press preview version of the game for the last few days ahead of launch. While our reviewer has ran into several game-breaking bugs on both Rift and Vive (and has only published a review-in-progress so far) we still wanted to livestream the game ahead of launch while we are able. Over the years this has been considered one of VR’s most anticipated games, originally being showcased alongside the HTC Vive years ago. In the game you’ll take on the role of a robot trying to escape an ominous corporation with a very Portal-esque vibe about it using a mixture of stealthy and thrown-object combat. We’ll be livestreaming Budget Cuts today on PC using an HTC Vive starting very soon (which means we’ll start at approximately 3:40PM PT) and aim to last for about an hour or so. We’re going to use Restream to hit both YouTube and Twitch at the same time! Let us know which games you want us to livestream next and if you want to see more Budget Cuts in the future. Comment with any feedback down below! The Sega Genesis will forever be an absolutely essential part of my childhood. I had over 60 games for the system growing up, countless controllers and joysticks, and spent hundreds if not thousands of hours completing the Sonic trilogy, adventuring through all four mainline Phantasy Star games, adventuring through my favorite Disney films like Aladdin and The Lion King, and generally getting to enjoy doing what Nintendon’t. Life as a Genesis kid in the 90s was great and now, thanks to the power of VR, it doesn’t just have to be a memory. Rather than simply simulating a large screen in a void like PSVR’s theater mode, the Sega Mega Drive and Genesis Classics collection on Steam has official and robust Steam support. As a single new feature in a large update full of new, free enhancements, the VR support is at first-glance an afterthought. But the real highlight is that it lets you experience all >50 Genesis games from the collection as if you’re sitting in a retro 90s-themed bedroom reminiscent of the one you or someone you knew may have grew up in. It reminds me a bit of the living room from Duck Season. It’s lacking some highlights from my own childhood of course, but it gets the job done. Sonic and Golden Axe posters adorn the walls, the trusty Genesis is stored below the old rounded-screen CRT TV, and with a quality Genesis-style USB gamepad you’d be good to go. Although, any gamepad would work just fine — or you can even use the Vive wands as well, but I’d recommend a gamepad of some kind with a dedicated d-pad on it. This is a pretty cool, free update. Also included are new challenge missions for each game, leaderboards, online multiplayer, mirror mode, and other graphics options. This same bundle just launched on consoles today, but there’s no word of the PS4 version having PSVR support. It’s only listed as Vive support right now. Also worth noting is that a similar effect has been possible for quite a long time using New Retro Arcade: Neon or just an emulator inside of Bigscreen. If you’ve ever dreamed of playing Sonic, Streets of Rage, or Phantasy Star in VR before, then here you go. Probably now what you had in mind, but it’s still a great blast from the past. Let us know what you think of these revived classics down in the comments below! The post Godzilla Conquers Tokyo In Earth-Shaking Hololens AR Experience appeared first on VRScout. The last thing I expected Budget Cuts to do was to make me question my mental stability, but here I am, standing over the crumpled body of a harmless worker-bot with a pair of scissors in its back. I put those scissors there. I found myself next to this well-mannered machine and smiled at his cheery greeting, then I killed him. I watched him wave his arms in unexpected agony and then drop to the floor, lifeless. And I smiled while I did it. 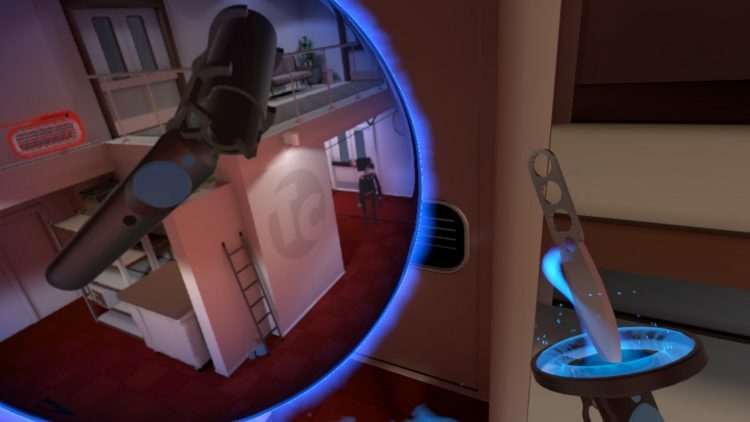 See, Budget Cuts, the long-awaited VR stealth game from Stockholm-based Neat Corporation, is probably the nicest, most polite virtual world you could visit inside a VR headset. It’s a tamer Aperture Science; office spaces are lined with visual jokes about every day being Taco Tuesday and its swinging soundtrack bumbles along at a pleasant pace even when you’re on the run from its robotic guards. But it also gives you one thing a lot of other experiences don’t, something that can cancel out all that kind-hearted world-building with a single stab in the back: freedom. It’s up to you how you make your way through the world of Budget Cuts. You can be as a ghost, albeit one that teleports, keeping to your knees as you dart between indenti-kit office cubicles, daring yourself to peek around corners to see if the coast is clear and scanning for hidden exits. Or, if you’ve got a decent throwing arm, you can take the decidedly more malicious route, locating sharp things to stab into patrolling guards, either picking them off one-by-one or doing your best Neo impression as you take everyone on at once. These choices are what make Budget Cuts thrive; there’s a spontaneity to the last-minute backstabbing and instinctive ducking that you just couldn’t get with a gamepad in your hand. But the chaos can go both ways, and you’ll often find Budget Cuts crumbles under the weight of this ambition, too. Take the path of the murderer, for example. If you choose to slay your way through the game you’ll see it at both its best and worst. For the former, it’s the super-slick sensation that comes with popping out from behind a corner, tossing a knife and then vanishing back behind the wall as your enemies slump to the floor. It’s just as brilliant when things go wrong within the rules of the game, though; if you miss you’ll put guards on alert and have to double back and assess your next plan. Better yet, if you hit something non-vital you’ll see the guard yelp in pain, but give them enough time to return fire before they succumb to their wounds. Budget Cuts constantly demands you formalize and act upon ‘Plan B’ at a moment’s notice, and it keeps you on edge throughout. The post Antilatency Brings 6DoF VR To The Oculus Go appeared first on VRScout. Augmented World Expo is this week in Santa Clara, California with an assortment of demos planned to preview next steps for VR/AR. The conference in the heart of Silicon Valley kicks off Wednesday with a series of talks followed by more than 100,000 feet of expo space to explore on Thursday and Friday. A 20,000 square foot “Playground” will showcase an assortment of experiences from across the spectrum of AR/VR. Ready for more cars in Gran Turismo Sport? No? Well you’re getting them anyway. The next update for Polyphony Digital’s PSVR-supported racer is due to release this week, series creator Kazunori Yamauchi recently confirmed on Twitter. It’s set to add nine new cars for free. We don’t know exactly what these vehicles will be but you’re welcome to try and guess based on the teaser image below. The replies to the tweet are filled with fans connecting the dots, so check those out too. As always, you’ll be able to jump into these cars and experience lifelike driving in the game’s PSVR mode, which now consists of both 1-on-1 AI racing and a time trial mode. While GT Sport’s PSVR-support has always been considered fairly barebones, the actual experience of driving these cars in VR is hard to beat, so it’s great to see more support come to the racing sim. We’re not yet sure what other features will be added in this update, though hopefully VR fans will have some more content to look forward to. Perhaps we can expect new track layouts for starters.